While stand-alone robo-advisor assets have flatlined, deep pocketed players are still circling, hoping to land a bargain and jump start their digital strategy. Firms are pitching themselves as technology plays rather than just online RIA’s that mostly eschew human advisors. TD Ameritrade is positioning their latest version of iRebal as the ‘Intel inside’ for online advisors. 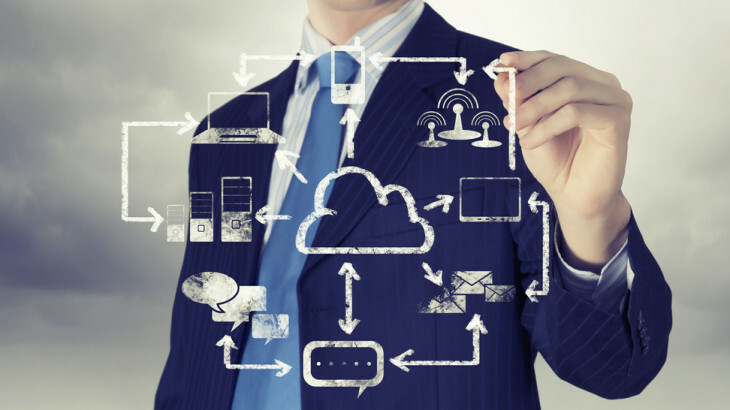 The technology savvy custodian that has always been on the leading edge of integration has opened up even more of their inner workings to partners and customers to access. iRebal is geared toward the investment advisory market, but with the latest updates TD has made the platform appealing to other potential customers, namely technology providers who want to build their own robo-advisors. The free rebalancing tool helps these firms keep the cost of their robo-platform low, while still offering excellent technology for efficiently managing client assets. iRebal offers a set of programming interfaces (APIs) that allow external applications to send messages. These can include opening a new account, triggering a rebalance or sending a model. These APIs are what enables firms to embed iRebal into their platforms as their rebalancing engine. Just as they do for RIA’s, TD Ameritrade is offering iRebal free to partners. This can be a huge advantage for digital offerings where a few basis points can make a difference in profitability. One of their competitors, Total Rebalance Expert (TRX), which was purchased by Morningstar last year, has been offering integration of their rebalancing engine for a while. TRX integrated with Orion Advisor Services back in January 2015. 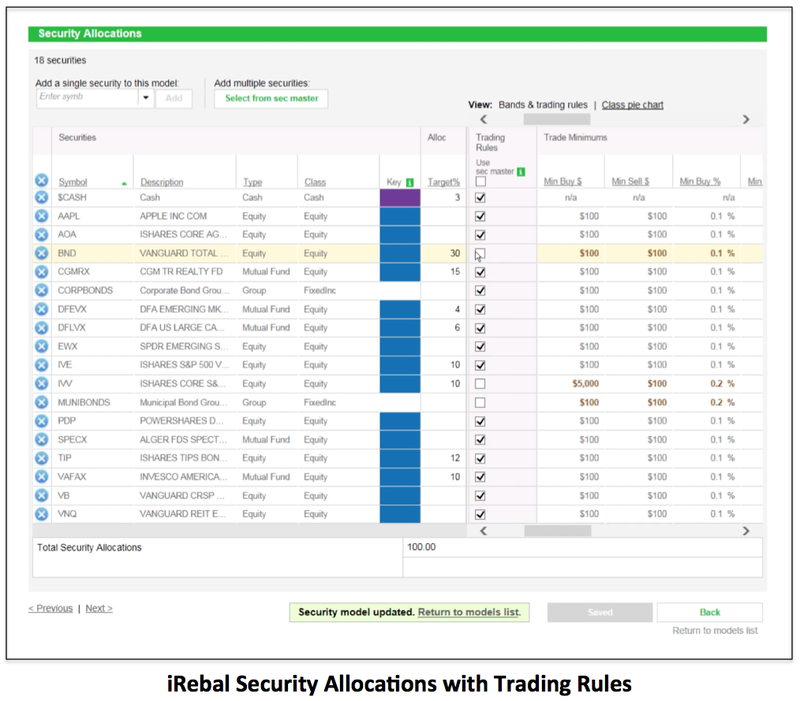 The iRebal cloud-based rebalancing platform comes at no cost to advisors, but only supports assets custodied at TD Ameritrade. I would think that this would be a deal-killer for RIAs using multiple custodians, but Fava claimed that a number of their clients do this. My consulting firm, Ezra Group, has done operational reviews for a number of large RIA’s. We have seen enough inefficiencies with operational teams that would be twice as bad if they had to use two rebalancers. I would not recommend this to any RIA looking for scale in their back office. All of iRebal’s competitors, such as TRX and Tamarac, are custodian agnostic. The Tamarac rebalancer can route orders directly to any of the custodians they support, mostly the big four RIA custodians, in the same seamless fashion that iRebal works with TD Ameritrade. Tamarac offers a number of additional order management features such as the ability to send orders to a prime broker (if an advisors wants to execute a trade away from the the custodian) and removing specific accounts from a block trade before it is sent. One important gap in the otherwise comprehensive iRebal platform is the lack of automated data aggregation. External assets can be imported into iRebal only through a manual file upload process. This is cumbersome and time-consuming and not in line with what I have come to expect from TD Ameritrade’s products. Most of the successful robo-advisors and robo-platforms have partners with a data aggregator such as Quovo, Albridge or Yodlee (now owned by Envestnet). They see data aggregation as a core part of their platform in two ways; to facilitate prospecting by providing the ability to show current holdings versus recommended and to make held away assets visible to the rebalancer so they can be taken into consideration when generating orders. There is no API access for partners to use a data aggregation tool to send data to iRebal. TD Ameritrade should add this feature to their pipeline in order to improve their appeal to robo-advisor platforms. 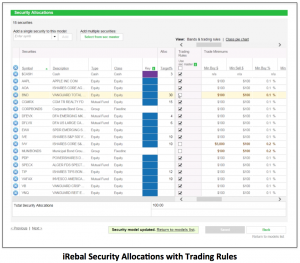 Customizable trading rules are a powerful iRebal feature that allow advisors to tweak portfolio model to support different client types, such as high net worth investors. A minimum alternate rule is useful when a minimum purchase amount on a security cannot be met. Naming an alternative security to purchase means the allocation can still be completed with a similar security for both large and small account sizes. These features can be quite useful for robo-platforms as well as advisors who can use them to lower minimum account sizes and serve a broader range of individual investors. Across different models, advisors can set minimum buy and sell amounts necessary to purchase different security types. For example, wealthier clients could purchase shares in a technology company, but clients with smaller portfolios would be directed into a technology ETF. In the case of a closed mutual fund, advisors can set an alternate-if-held rule. Existing shareholders can continue to purchase shares in the closed fund, but new shareholders would purchase an alternate fund in its place to fill the allocation. The platform supports multiple rebalancing methods, including the commonly used daily cash sweep. 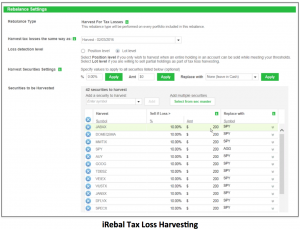 Advisors can set iRebal to look through client accounts for unallocated cash on a daily basis, then put that money to work in the chosen portfolio model. Trading in mutual funds with early redemption penalties are flagged so advisors can reroute any trades that would incur fees to clients. Advisors can assign multiple security types to one model in iRebal, or use a model-of-model approach to bring in strategies from different money managers. However, iRebal falls a bit short in not being able to support sleeve-level performance reporting, which would help advisors present the performance of separate managers in a Unified Managed Account (UMA). Fava claims RIAs have not shown much interest in UMAs, which may be true at present. But as advisors look to differentiate themselves from the coming DOL-inspired flood of fee-based advisors, UMAs will become more interesting sleeve-level performance will be required. 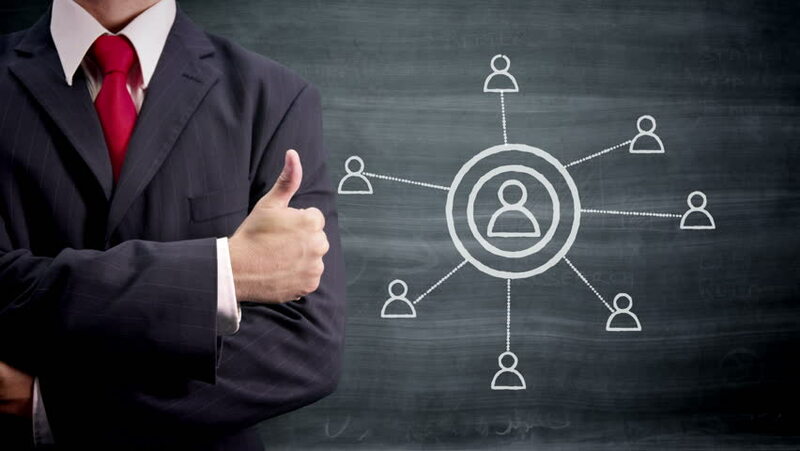 Every advisor should be managing client assets with an eye toward tax efficiency. This can get tricky when managing both taxable and tax-deferred accounts. Many advisors essentially do double work in managing two similar portfolios with different tax treatments. 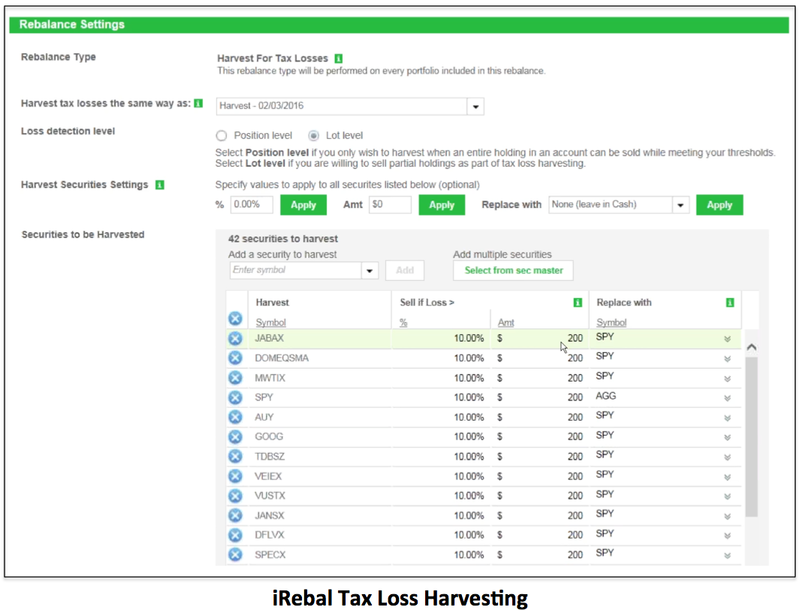 iRebal helps advisors eliminate this double work with its tax location level feature. This means advisors no longer have to run separate models for taxable and tax deferred accounts—they can identify specific securities to place in a taxable account by designating their tax efficiency. The net result is tax-efficient securities like municipal bonds would be put into taxable accounts, while tax-inefficient securities would be put into tax-deferred accounts. Advisors have to identify how each security ranks on a tax efficiency scale, from +100 to -100. This process is not automated—advisors will want some discretion in deciding which securities to place in a taxable versus tax-deferred accounts. According to Fava, each tax-efficiency rating can be set at the security master level. They don’t have to set this rating for each model they run, only once at the security level for it to apply to all models under management. This feature works well for clients with both taxable and tax-deferred accounts. But if a client only has a taxable account, the advisor can name an alternate tax-efficient security to replace one that is tax-inefficient. TD has upped the game on an already great platform with a host of new features in this most recent iRebal version. In my opinion, the platform could use more in the way of automation and integration with data aggregators to make it easier for advisors to manage clients’ holistic financial picture. iRebal’s latest release positions TD Ameritrade to continue to serve their core market of RIAs with advanced capabilities that support a wide variety of client needs. They may also become the defacto choice for robo-advisor platforms rebalancing, which could open a new channel for driving assets to their profitable custody platform.